The sound of enthusiastic applause filled the church when Dr. Henry Cloud concluded his message this weekend. He spoke about a struggle common to all of us. He spoke with great wisdom and understanding. We recognized ourselves in the stories and were thankful to find that, as always, the answer to our questions was tucked away in the pages of scripture. He spoke from the thirteenth chapter of Luke - the parable of the fig tree (13:6-9) - a lesson on "Getting Unstuck." Dr. Cloud provided a recipe whose simple ingredients are: Dig - Fertilize - Year. Before we can use the recipe there is something we need to understand - the "why" I cannot seem to break the cycle of "try to change - fail - guilt - try harder - fail..." It was this that the Spirit wrote in bold letters across my heart; this that I need to make my own once and for all. Like the fig tree in the parable, there are things in my life that need to change so that I can produce fruit. I know these things well and struggle to change only to fail over and over again. The man's solution to the problem of the barren fig tree was "Cut it down. It's just taking up space in the garden." (verse 7) It is the voice of judgement - living under the law. Sometimes it is the voices of others. More often it is a far more familiar voice. "When I fail to live up to my own expectations, I hear my own condemning voice and call it conviction," said Dr. Cloud. I put myself under the law, and in so doing the fruit I produce is anger, guilt, shame and condemnation. I simply cut myself down. Jesus comes to my rescue and stops the voices of condemnation. "Leave her alone," He says. Before I can get better, I need no condemnation, and this is what grace offers me. Grace - from the One who took all my sin and gave me His righteousness. When I accept grace, I am ready for the recipe: Dig - Fertilize - Year. We dig, with help, to find what is hidden under the surface - the real reason we cannot seem to make the change we know we need to make. Grace comes next, the fertilizer that provides what we cannot do for ourselves. It comes from the hand of a loving Father. Then we need to give ourselves time. It takes time to get better. There is no need to hurry. We are on a journey - one that is filled with joys and sorrows and circumstances we could never have imagined. It is a journey that takes a lifetime. Jesus takes you by the hand and walks it with you. It is His delight. "So there is no condemnation for those who belong to Christ Jesus." "Who then will condemn us? No one - for Christ Jesus died for us and was raised to life for us, and He is sitting in the place of honor at God's right hand, pleading for us." Linking to Michelle's: Hear It On Sunday. 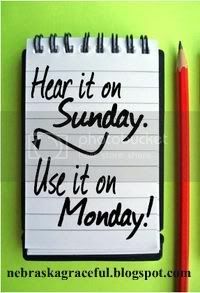 Use It On Monday. apply. Thank you for sharing. It is a shame that this message that is woven in the scriptures has taken such a detour to become more wide-spread. Growing up it was fire and brimstone. Scare tactics were used to get people down to the altar. Now that we were scared, what in the world would we want to have anything to do with that kind of a god? I am thankful that He revealed himself to me layer by layer as I could hear it. I am thankful that there were loving ambassadors along the way that showed me there was TRUTH and GRACE. I love your sharing this and all that you write. Your steady stream of simple observations skillfully written are woven artfully with such revelation. Blessings and keep it up dear one. Oh this is so good, Linda. I know that condemnation and conviction are two totally different things, but sometimes I falter at what to do when I am convicted, meaning I need to figure out the root of the problem and take care of it. Being a gardener, I understand this analogy. I recently repotted several plants that weren't doing well in a certain kind of pot and I put them in a protected area of the patio where I have been 'nursing' them. They are responding well. Whereas I cut one clear back and it just died (not a perennial), but I didn't change container or location or nurse it. I don't recall this particular parable--will look it up. Thank you for sharing. I need this as I begin school. I got my schedule and "Oh boy!" Thank you so much for sharing this Linda. Having just had a real conviction of my own failure, it is a blessing to read your words and to understand that it's okay that it takes time to get better. Thanks for visiting my blog last week and your encouraging words. Linda, You have no idea how this post has impacted me tonight. Just 20 minutes or so ago I was ruminating on the thought-process that ran through me head on the drive to work this morning -- in which I blasted myself for a long list of failings and the discouragement I felt in recognizing that failure. Of course, I forgot about grace...and the gift of time! You are a balm to my troubled soul tonight, dear friend. "There is no need to hurry." That in itself is a good reminder. That was a great read...with lots of little lessons in it.